A train crashed into a crowded bus in eastern Ukraine on Tuesday, killing 42 people on the bus, including two children, and injuring nearly a dozen others, officials said. The Interior Ministry said the accident occurred outside the town of Marhanets in the Dnipropetrovsk region after the bus attempted to cross the track, ignoring a siren that indicated an oncoming train. The Emergency Situations Ministry said in a statement that two children were among those killed. Police officials had said earlier that 11 survivors were in critical condition with grave injuries. 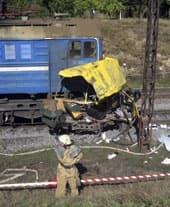 Road and railway accidents are common in Ukraine, where the roads are in poor condition, vehicles are poorly maintained and drivers and passengers routinely disregard safety and traffic rules.